Use Batch Data Synchronization for synchronizing content of groups of tables, views, virtual tables or stored queries. Data synchronization of the selected pair of objects is one-way. In order to synchronize in both directions, it is necessary to execute two synchronization procedures. 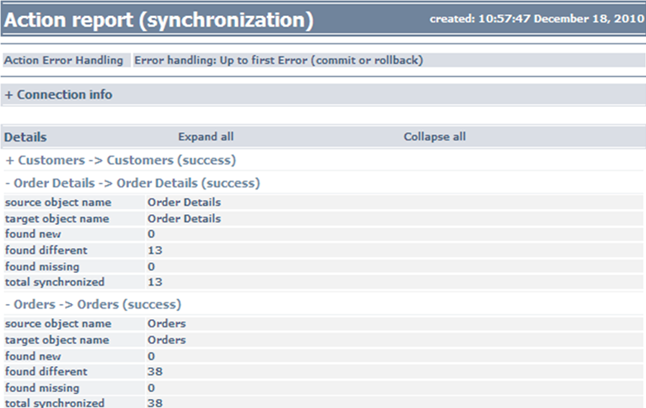 Batch Synchronization is used for synchronizing tables, views, virtual tables, and saved queries. Note that only database table or view can serve as the synchronization target object. The user is responsible for selecting the pair of objects meant for synchronization. Synchronization itself - generating the appropriate synchronization script and its execution. At the comparison stage, the program is using same rules and settings that are used for simple data-comparison. The execution of the generated synchronization script can be launched immediately following the conclusion of the synchronization procedure, or it can be postponed and launched later. The user is able to save the synchronization script into a file for further analysis and future use. Select and map the objects intended for synchronization in the Batch Synchronization dialog. NOTE:The program maps the objects of the selected groups automatically, on the object names basis. However, the user can manually redefine any object pair for further synchronization. Insert missing records - Insert/do not insert records that are present in the source table and are absent from the target table. Update different record - Change/do not change field values in differing records. Delete obsolete records - Delete/do not delete records that are present in the target table but are absent from the source table. Figure 24: Allowable Synchronization Actions. Ignore Errors - Ignore any errors, continue the procedure and save the successfully completed changes in the target table. Up to first Error - At the detection of the first error, stop the procedure without saving any changes in the target object. Up to end - Continue the procedure regardless of any errors; however, do not save any changes in the target table if even one error occurs. In order to save the generated SQL synchronization script into a file – check the Save synchronization script to file option and set the parameters of the saved file. Figure 26: Storing the SQL Synchronization Script. In order to create a report on the synchronization procedure – check the Synchronization report box and set the parameters for the report file. The program supports two report-file formats: XML and HTML. Figure 25: Request for the synchronization report. The program will execute the procedure and create a report (if the appropriate option was selected ).